Presenter: Dr Timothy S. Dobe, Associate Professor of Religious Studies, Grinnell College, and Visiting Fellow, Duke University's Islamic Studies Center. Timothy Dobe will discuss several visual images of M.K. Gandhi, embodying important dimensions of Sufi traditions and Gandhi's own deep relationship to Islam. The images of Gandhi by the Indian Sufi writer, Khwaja Hasan Nizami from the 1920s, drawn during Gandhi's rise to fame in the context of the Khilafat movement, places the Mahatma in an important, broader Islamicate context of Muslim cosmopolitanism and PanIslamism. 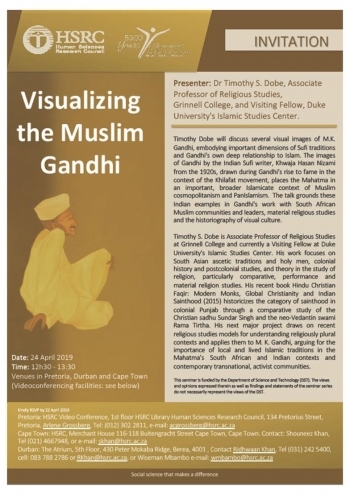 The talk grounds these Indian examples in Gandhi's work with South African Muslim communities and leaders, material religious studies and the historiography of visual culture. 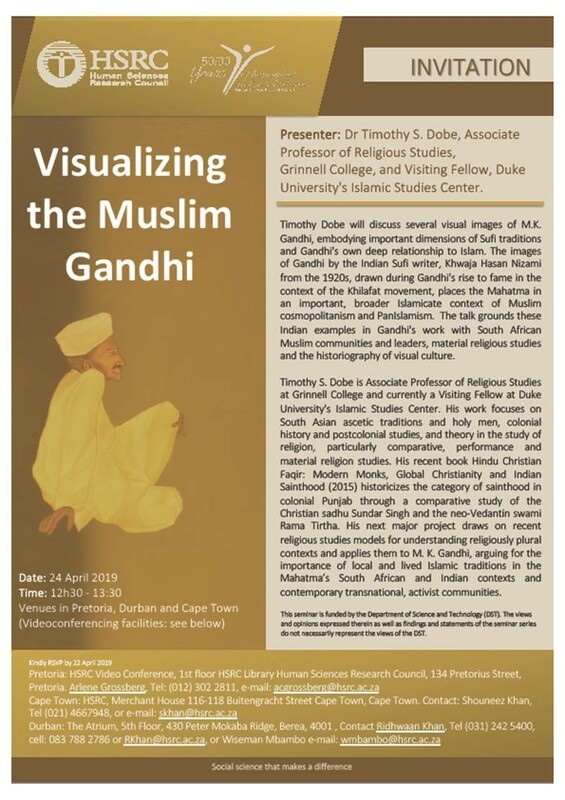 Timothy S. Dobe is Associate Professor of Religious Studies at Grinnell College and currently a Visiting Fellow at Duke University's Islamic Studies Center. His work focuses on South Asian ascetic traditions and holy men, colonial history and postcolonial studies, and theory in the study of religion, particularly comparative, performance and material religion studies. His recent book Hindu Christian Faqir: Modern Monks, Global Christianity and Indian Sainthood (2015) historicizes the category of sainthood in colonial Punjab through a comparative study of the Christian sadhu Sundar Singh and the neo-Vedantin swami Rama Tirtha. His next major project draws on recent religious studies models for understanding religiously plural contexts and applies them to M. K. Gandhi, arguing for the importance of local and lived Islamic traditions in the Mahatma’s South African and Indian contexts and contemporary transnational, activist communities.